The Wall Street Journal carried this article on 10/29/10, discussing cases relying on the US Supreme Court case Graham v. Florida. Judges are grappling with whether it is ever proper to sentence a juvenile to life in prison without parole in light of a Supreme Court decision that such a punishment for non-murderers is cruel and unusual. 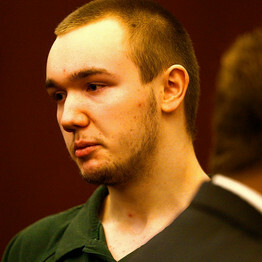 Dakotah Eliason, 15, was sentenced to life without parole Monday in a Michigan court. In its May ruling, the Supreme Court reasoned juveniles are less culpable than adults for their crimes because they are less able to control their behavior, and they have a better chance of being rehabilitated. “A life without parole sentence improperly denies the juvenile offender a chance to demonstrate growth and maturity,” wrote Justice Anthony Kennedy for the majority in Graham v. Florida. Since the decision, state courts have been reducing the sentences of prisoners covered by the ruling. An Iowa judge last month decided that Jason Means, 34 years old, who was serving life without parole for a kidnapping committed when he was 17, was eligible for parole. Approximately 150 inmates are automatically eligible for lighter sentences, according to attorneys. But the impact could be broader still as the ruling has emboldened attorneys nationwide to push for shorter sentences for juveniles serving life sentences for murders, a larger inmate population. Roughly 2,500 inmates are serving life without parole for crimes committed as juveniles, according to one 2009 survey by Human Rights Watch, which opposes such sentences. Forty-four states allow life without parole for juvenile offenders, generally defined as being under 18 when they committed their crimes, while six states bar such sentences. The vast majority were convicted for homicides, so they don’t automatically qualify for resentencing under Graham, according to attorneys. 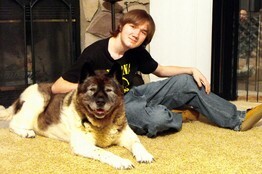 Dakotah Eliahson with his dog, whose death traumatized him. Mr. Ligon’s appeal is likely to be one of hundreds of cases testing the reach of the Supreme Court ruling. Last week, the Missouri Supreme Court heard arguments in a case that contends that Graham should apply to the case of an inmate sentenced to life without parole for killing a police officer at the age of 15. The Graham decision, which involved a juvenile sentenced to life without parole in connection with a burglary and attempted robbery committed at 16, continued the Supreme Court’s recent record of supporting leniency in sentencing young offenders. Five years ago, the court struck down capital punishment for juveniles. Defense lawyers and juvenile-justice advocates, who plan to test the reach of the Supreme Court ruling in cases across the country, concede that it will be difficult to persuade judges to significantly reduce life sentences in non-homicide cases, let alone to offer sentencing relief in murder cases. Indeed, courts in Alabama and Missouri have already declined to extend the Supreme Court ruling to murder cases involving juveniles. On Monday, a state judge in Michigan handed down a life-without-parole sentence to Dakotah Eliason, 15, who was convicted of murdering his step-grandfather earlier this year. The defendant, who was 14 at the time of the murder, had suffered recent traumas, including the deaths of his cousin, friend and dog, according to his lawyer, Lanny Fisher.